When a person is in an accident and they suffer a traumatic brain injury there may be damage to axons which triggers a whole series of events in the brain. 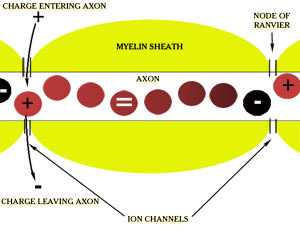 For a full explanation of how axons work and what happens to them once they have been damaged click here. You may also want to go to our page that deals with micro inflammation by clicking here. Both of these pages go into detail on the subjects and will explain the effects of traumatic brain injury on the axons and explain why inflammation effects the brain cells. Inflammatory Effects: Scientists have found, even though every traumatic brain injury patient is different, the underlying pathophysiology could include micro inflammation and this is an important factor and should be tested regularly even after several years of the brain injury. There are a lot of technical terms here and some of this content may be hard to understand. Unless you have some kind of background in science or medicine this may all sound “greek” to you. By visiting the other pages mentioned above, you may get a clearer idea of how it all works.